Nothing yet. Probably a glass of Merlot later. Amstel Light and a glass or two of Cabernet. Beer, as is my wont. lemonade flavored..... koolade.. im officially...... whipped. Old Milwaukee Light in this house! Becks. 12 packs on sale for 10 bucks. I forgot how good this stuff is. Crown Royal Reserve today. I went to my bar and discovered my last bottle of Lagavilin was empty and no other scotch (at least that I want to open today)! I'm slummin with Canadian Club tonight. That my usual go to drink. Tonight is margaritas woo who! Man, That Lagavulin is some great stuff!!!! Pricey, but worth every drop!!! Keystone light since I have to live on the cheap after paying property taxes. $11.97 for 30 pack. Good stuff. One of my favorites. 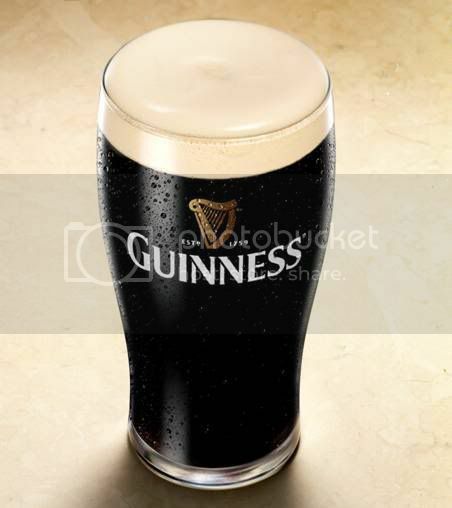 "A pint of the black stuff, landlord." Lineage 2001 Cabernet Sauvignon...bought in 2004 for $9.99 a bottle...today...priceless! Cheers! Yep, don't mix good bourbon. Get the cheap stuff for that. i have a bottle of paul masson but i haven't even opened it up yet. you know i'm bored when i'm not even interested in drinking. can't decide whether i want to start drinking this or just watch survivorman then go to sleep. Survivorman + Castillo rum then its on to cheap beer. Whole Foods Costa Rican blend coffee. I'll get looped on brandy and watch Red Dawn or Way of the Gun later tonight.